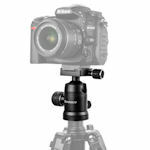 Barska offers two tripod heads: a ball head and a pistol grip ball head. Both have quick release plates for easily connecting and disconnecting your camera or scope to or from the tripod. Barska heads consist of a standard ball head and a pistol grip ball head.